At CyberUSA 2019, attendees continued building dialog, working together to share information and best practices across the nation’s cyber communities. Working together, these groups shared strategies for innovation, education, workforce development, enhanced cyber readiness, threat intelligence, cyber resilience, and risk management. Hosted by the non-profit, CyberUSA, this national summit brings together the national ‘community of communities’ and encourages sharing between trusted groups across multiple states to improve cybersecurity at all levels of participation: local, regional, and national. Visit the CyberUSA 2019 Agenda here. WELCOME! 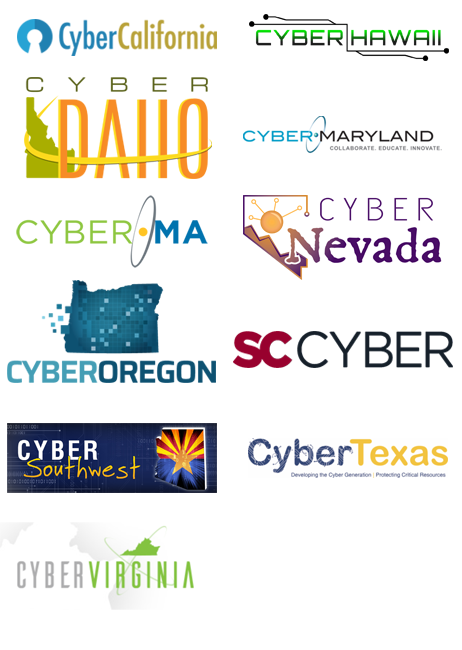 CyberUSA welcomes CyberWA (CyberWashington), CalCISO (California) and FloridaCyber / Southeast Cyber providing leadership for CyberSoutheast - this group is also the CAE Regional Resource Center for the Southeast US, which includes FL, AL, GA, MS, SC and PR. These groups join the Midwest Cyber Center, Made Safe in Wyoming and the Technology Association of Louisville, as the newest CyberUSA state affiliates in 2018. Visit the links below to to find out more about each of these leading organizations. Midwest Cyber Center Joins CyberUSA!